Now we’re getting into the longer of the long runs. This week the half runners will stretch their miles to 9 while the longer runners go for 18! Some business first: After next week I’ll be heading off on a business trip that’ll take me away for the rest of the Sundays of this long run period. I need someone to step up and be the main organizer of the rest of the runs. I need the rest of you to step in and help that person with water stops. Let me know if you can help out. This is a group effort, lets everyone help each other get to the starting line! This week we’ll be running a longer, challenging run. The shorter distance is up Main to Green to the LynnFells Parkway out to the Saugus entrance to Breakheart. There will be a water stop there before you go into the park and circle Breakheart. Go in to the right and go counterclockwise. When you get to the beach stay to the right to bring you around the long way. Pound through those hills (keep your back upright and your legs turning over) till you get back to the water stop. After the second trip to the stop you head back the way you came to finish up the run. Or at least this is what it looked like when Google took its last picture. Here you want to bear right onto Lowell Street, the road to the far right here. Lowell Street will take you up to Lake Quannapowitt. When you get to the lake take a right past the Gingerbread Construction Company and your first left into the Converse Parking lot at the top of the lake. In that lot will be a water stop. After that stop continue over to North Ave where you turn left. Run to Church Street where you go left. Then when you get to the church take a right on Common and merge onto Main Street. Main Street will get you to the next water stop at Nick’s Pizza. Not done yet. The next segment will be your last though. Straight down Main to Brueggers and you’re done!!! Water stops. Oh, I need lots o’ help this weekend. If I get a dedicated volunteer to help with all the stops we can handle it with two people. Otherwise: If I can get a car to park at Breakheart I’d appreciate it. Perhaps a pair of half distance runners can team up and drop a car there. I’ll bring supplies and leave it there and then after your run ends you can come pick it up. That’ll let me scoot over to Wakefield High when I need to. The next stop I need help at is at Lake Q. Again if two long distance runners pair up and leave a car there I can swing by and drop some supplies there as well during my travels. I’ll cover water stops at Wakefield High and Nick’s Pizza. Let me know who can help with stops and who’s in for the run! Last week’s jaunt through the highlands of Winchester on a nice cool August morning was a long one, so this week we pull back to about 14 miles and let those legs recover. We’ll be going back to our old friend Spot Pond as we run what used to be the Law Enforcement Memorial Half in Melrose. This race then moved to Wakefield for a few years and then became Boston’s Run to Remember. 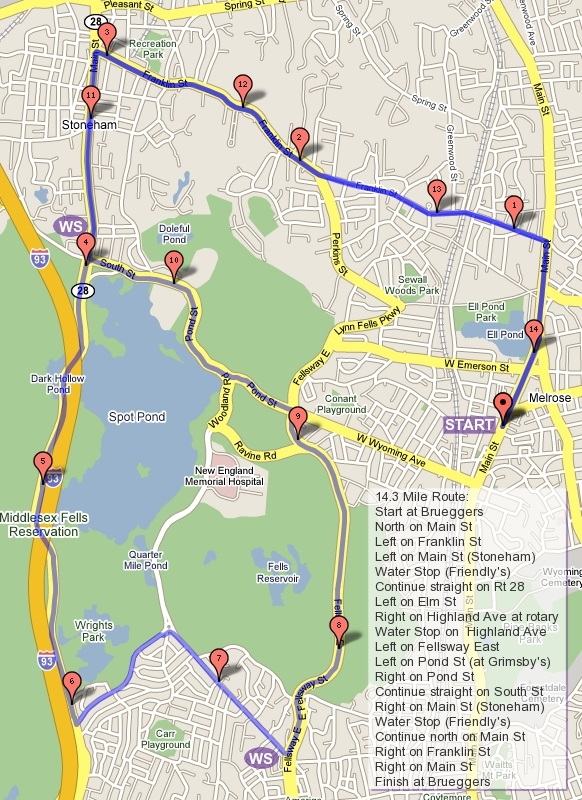 The run will first take you over to where the start line was by going up Main Street, past Ell Pond, left on Melrose Street and left onto the LynnFells Parkway. As you pass in front of Melrose High School, the starting line was just before the knoll. Keep going through the start to the lights at Tremont Street where the tennis courts are. If you’re running short, keep going straight, if you’re running long circle the neighborhood around Ell Pond by taking a left on to Tremont, your first left onto Lake Ave, your first left onto W Emerson, and then your first left onto Main. Again take a left on Melrose Street and a left onto the LynnFells Parkway back to the start. From here continue on the LynnFells Parkway and try to eat into that head start you’ve given the shorter route group. As you go along the LynnFells Parkway we’ll have a water stop at Grimsby’s for you. From there you keep going straight to the Fellsway East, through the hills to Highland Ave. Right on Highland and up to the water stop before the rotary. After that water stop, if you’re going short stay to the right onto Woodland and follow the front of Spot Pond to Pond Street. Turn right on Pond, straight through the intersection to West Wyoming, left on Main St and you’re done. If you’re running long go left after the water stop onto Elm St and circle Spot Pond: Elm to a right on Main St, cut through Straw Point just prior to Friendly’s, head over past the Stone Zoo and back to Woodland and the water stop. After the second pass through the Highland Ave water stop go left on East Border Road and then left onto the Fellsway East. Run the hills again keep going straight onto the LynnFells Parkway. While you’re training on all those hills imagine trying to have a good finish to a real half race through them. That was one tough half marathon! When you come out by the high school the race would do a lap around the track that no longer exists around the football field. You’ll keep going straight though up to Melrose Street. If you’re feeling a bit hot there is a Melrose High School Marching Band car wash going on at the High School Parking Lot on your left as you approach Melrose Street. I’ve heard that they may be easily convinced to give free spray over a runner if you run by. (And if you need a car wash, stop by after your run to help out the band). Once you get to Melrose Street either wet or dry, take it up to Main Street, take a right and bring it home to Brueggers. Water Stops, I need a little help on this one. A car at Grimsby’s and a car at Straw Point would be helpful, or just one person that can assist through the run. If you can drop your car at either place I’ll get supplies out to it, and I can pick you up or someone else can. If you do help out, if you can leave a piece of paper that says MRC on the dash it’ll help people find unmanned stops. Anyone? Ok… Who’s in? ROLL CALL! The title is part of a quote from a movie from 2004. I’d see if anyone could guess but in the age of Google the trivia answers are just a click away. Anyway, last week we had a pretty large group, I’d guess around 30, head out to Breakheart. The sun made for a hot run, but the shade in Breakheart almost was relief enough to make you forget you were climbing hills. If you liked those hills (and even if you didn’t) we have more hills this week. Yay!? This week let’s go to the Winchester Highlands for a long run! Again, if you’re running short you may choose to run the middle part of the run. If at least one person does that it would be great because I need a car to stay at Eugene Street for a water stop. Anyone? The route starts at Brueggers and heads up Main Street in Melrose to Franklin Street out to Stoneham. If you ran the Horn Pond Route a few weeks ago you’ll recognize you’re running the end of that route in reverse. Pass Stoneham High School and Dunkin Donuts and continue up to a set of lights. Take a left there on Summer Street which will bring you out to Main St in Stoneham. Cross the street onto Marble Street, which will take you over I-93 to Forest Street in winchester. On your left will be Water Stop 1 on Eugene. If you’re running the short route turn it around and continue to reverse the route from two weeks ago. Turn right on Park Street, follow that past Friendly’s, past the Stone Zoo and over to Park Street where you’ll go right down past Grimsby’s. Continue straight on West Wyoming until you back to Main Street in Melrose. A right there will bring you back to Brueggers for just over 8 miles. If you’re running the long route leave the water stop and ride a down hill on Forest Street to Highland Ave. Turn left there, where you see the blue sign with the big white H pointing you to Winchester Hospital. As you pass the hospital look for Reservoir Rd on your left. Take the left and run up by the Fells. This is my favorite street of all the SLR routes. Enjoy the view of the reservoir, the woods along the left side, the big houses on your right side, the fancy lampposts lining the street… and ignore the big hill. Reservoir Rd will loop you back to Highland, go left on Highland and keep on chugging through the hills of the Winchester Highlands. Note you’ll hit a 5 way intersection along the way, go straight through (not a left, or either of the two rights, straight!). At the end of Highland Ave you’ll find Water Stop 2. After the water stop go right onto Main Street (RT 38) in Winchester. Get to a rotary and don’t take your first right off the rotary onto a tiny street, take your second right off the rotary onto a big street which is still Main Street (RT 38). This will take you to another 5 way intersection. You’re going to go onto Washington Street here, its not a right turn, its not the two left turns, its a bear right. Washington will take you to the Gingerbread Construction Company where you’ll turn right onto Forest Street. Climb up the big hill and you’ll find the water stop at Eugene for Water Stop 3. After this stop you’ll go back over I-93, right on Park over to Friendly’s. From there you’ll turn right and follow the back side of Spot Pond on Main Street in Stoneham (RT 28). Follow the pond loop by taking a left on Elm and a left at the rotary onto Woodland Street. Follow that back to a right on Pond Street to bring you past Grimsby’s onto West Wyoming and into Melrose. Take a left on Main Street and head back to Brueggers! Again, I’ll do the water stops but I need a car at Eugene. Either someone running a modified route or someone who’ll park there and I’ll come pick you up before the run to get you to the start. Any volunteers? I can’t do all of this on my own. Ok. Who’s in? I know you’re all out there, post so I know how much Gatorade and water I need. ROLL CALL! If you’re a runner (which you are, because you’re reading this), you can’t complain about the weather we’re having. For August, to wake up to cool morning temperatures with relatively low humidity is a treat. We had a comfortable run out to Horn Pond and back last week and it sounds like another nice running morning to go to Breakheart this Sunday. For those that trained in the winter for the first time with us, you didn’t get the full Breakheart experience. The snow kept us out of there most of the winter, and when we could get in you only made it through the flat (easy) section. Well there’s no snow in August! Bring on the hills!!! We’ll start the run like we did in the first week of training. Head up Main Street to Melrose/Wakefield Hospital and bear right on to Green Street. Turn right onto the LynnFells Parkway to a set of lights at Main Street in Saugus. Turn left there and follow Main Street straight onto Farm Street in Wakefield where Wakefield High School is. This is where you’ll find the first water stop. From the first stop you’ll run up to the Northeast Vocational School, throught their parking lot to the Wakefield entrance of Breakheart. Keep to the right and make a counterclockwise loop through the park. Hills first, easy side last. Note when you loop around the easy side you’ll come to a beach area, keep right there to bring you back to the Voc. Exit at the Voc and make your way back to the water stop. After the water stop follow the week 1 route again by running right onto Farm Street, left at the end of Farm onto Water Street, Water into Wakefield Center where you take a left and bring it on home to Brueggers. Shorter distance runners. This week you can run the designated route OR you can park at the LynnFells/Main St in Saugus intersection (in the bank parking lot) and join in the run a few miles in. This will give you about the right distance with the added benefit of Breakheart in the middle of the run. The mapped route will take you out with the long runners to Main Street in Saugus where you’ll turn back down Howard Street to Green Street (just like week 1). When you get to the LynnFells you turn right and follow it as if you’re running the MRC Summer route backwards, LynnFells to a left on West Wyoming at Grimsby’s, to a left on Main Street and back to Brueggers. Ok, only one stop, I can handle that. I’ll stop at the Howard Street corner for the shorter route runners then race over to Wakefield High School. Of course if anyone wants to help I’ll always take it. Last week we had a good run, almost 30 people, up to Wakefield and around Lake Quannapowitt. This week we’ll be heading west, to Woburn and around Horn Pond. If you’re running short you may chose to join in at Water Stop 1 and run the middle part of the run, the more scenic section. The run, as always, starts at Brueggers at 8AM. We’ll head south on Main Street to West Wyoming Ave. This will take you tpast Grimsby’s up Pond St to Spot Pond where you’ll go right past the Stone Zoo. When you get to Friendly’s keep going straight and follow past the on ramp to I-93 North along Park Street in Stoneham. At the next set of lights turn left onto Marble Street and take that over I-93 into Winchester. The first water stop will be at the corner of Eugene Street on the left after you pass I-93. If you’re following the half distance you’ll turn around there and head back on Marble going straight through the lights at Park continuing on Marble. Crossing Main St in Stoneham the road will change to Summer St. Summer will take you to Franklin Street. Turn right on Franklin and follow that into Melrose all the way to Main Street in Melrose. Turn right on Main Street and head back to Brueggers. For those running longer you’ll leave the water stop and continue on what is now Forest Street in Winchester. A long downhill will take you to a set of lights where the Gingerbread Construction Company is. Turn left there onto Washington Street. At your next set of lights you’ll turn right on Cross Street. Cross will take you into Woburn where you’ll eventually hit Rt-38, Main Street in Woburn. Turn right onto Main and cross over to the opposite side of the street. After a short distance you’ll turn left on Lake Ave. Lake takes you not to a lake but to a pond, Horn Pond. You’ll find a parking lot off Lake Street, here you’ll find water stop number 2. After a break there you’ll run a loop of Horn Pond. There is a paved path leaving the lot. Follow the pavement hugging the lake. At the other end of the lake be sure not to wonder to the left into… I don’t even know where it goes… just follow the paved path to the top of the lake. The other side of the lake will bring you along a street back to Lake Ave. Turn left there and go back the way you came (Lake to Main to Cross to Washington and up Forest) back to Water Stop 1. From this water stop you’ll trace the steps the shorter route runners already ran (see above) along Marble St to South St right on Franklin and right on Main and back to Brueggers. This route has two water stop locations that are difficult for one person to manage so I’d like some help. Either a full time volunteer or a someone who will do the run from water stop 1. You can keep your car parked at Eugene and we’ll move some supplies into it before I move to Water Stop 2. Who can help me? And who’s running? ROLL CALL!